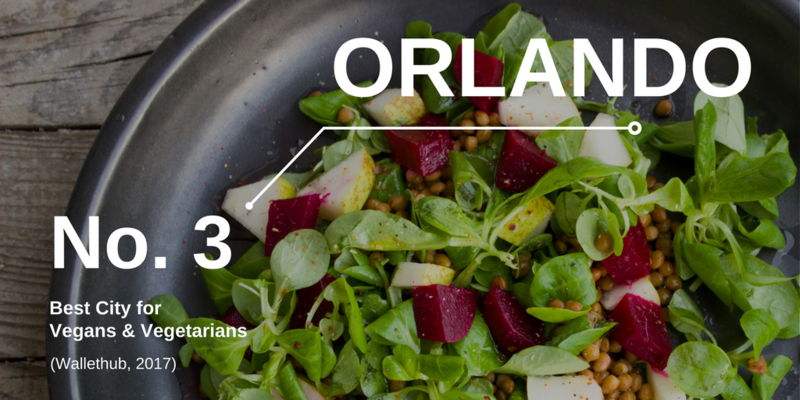 With a large variety of entirely vegan menus and chefs, Orlandoans never run out of affordable options to eat meat-free. Orlando’s restaurants cater to the regions booming population of millennials demanding sustainable, ethical and plant-based cuisine, at the right price. WalletHub determined the cheapest places for a plant-based diet by comparing 100 largest U.S. cities across 15 key indicators that adhere to the vegan and vegetarian consumer. Orlando ranked number three, right behind foodie giants like New York and Portland. When looking for plant-based options in Orlando, a black bean veggie is far from your only option. Orlando’s vegetarian cuisine selections range from high-class culinary to comfort food, both of which will leave you craving for more veggies for your next meal. Many of Orlando’s vegan restaurants are locally owned and operated. Ethos Vegan Kitchen is the perfect place to bring your non-vegan friends; while still 100% vegan, Ethos offers hearty, homestyle fare that includes meat-like substitutes like “Chickun”. Market on South offers both plant-based dining at Dixie Dharma as well as a wholly vegan bakery, Valhalla. The Sanctum Café features two of the most creative plant-based chefs in the country, with a high-end menu wholly sourced from local vendors. Orlando also offers a wide diversity of vegan offerings. For Asian-style cuisine, head over to The Loving Hut on Colonial Drive. Donut options abound, from Orlandodough to Valkyrie Doughnuts. And The Vegan Hot Dog Cart can satisfy your street-food craving – their vegan hot dog was ranked the #1 Vegan Dog in America by PETA! The slow food movement has taken root in Orlando, where a healthy lifestyle extends beyond food and into a way of life. Dandelion Communitea Café combines cuisine with community: the vegetarian café is a gathering place for a diverse cross-section of people with regular cultural events such as art openings, poetry night, eco-networking, moon circles, and other special events. You’ll also find vegan baked goods, meat-less options and even vegan cheese at local neighborhood farmer’s markets, including Audubon and College Park. Orlando is pioneering the plant-based movement with a plethora of affordable, but never boring, vegetarian and vegan selections.